Winding, python-like river beds were shallow, dry ... lime-green areas, purple centred ... This was proper painter's country ... barren, patterned by zig-zagging straps, snakes wriggling off between different mountain ... Lake Rudolph became ineffably blue, breathlessly beautiful, as we approached over ground made up of every grey and brown hitherto unimagined. There were unsuspected varieties of pale orange, a new blue, strange whites. A volcano made a neat scoop beside pools, bays and spreading cut-off lagoons of verdigris and prune. Sidney was wrenched sideways, almost standing, concentrated, taut, his eyes like arrows shooting to nail this enchanted moment. Its communication, once crystallised, would be stored, held intact yet forgotten until unconsciously rather than by an act of will it would be called upon in some unpredictable future. Signed l.r. corner, beige oil "N [in reverse]". Not dated. Signed and dated u.r. verso on board [upside down], red chalk "…/ 22 / 2 / 63/ Nolan". Signed and dated c.l. verso on board [vertically], black pencil "22 / 2 / 63/ Nolan". Barry Pearce, Look , 'Sidney Nolan and the genius of painting', pg. 12-13, Sydney, Jul 2006, 12, 13 (colour illus.). Nicholas Usherwood., Nolan's Nolans: a reputation reassessed , 'Introduction', London, 1997. NOTE: General reference. Also see cat.no. 65: 'Rimbaud at Harar' 1963. Art Gallery of New South Wales annual report 2006 , 'Year in review: Australian art', pg. 20-22, Sydney, 2006, 20, 22 (colour illus.). Look , 'Nolan's Africa', pg. 13, Sydney, Dec 2014-Jan 2015, 13 (colour illus.). 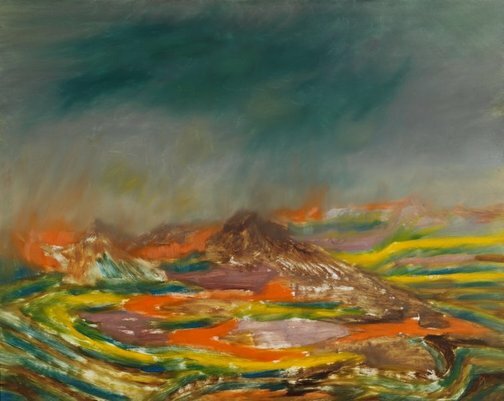 Sidney Nolan: such is life , Melbourne, 1987, 160-167. NOTE: General reference. Sidney Nolan: myth and imagery , London, 1967, 38-45. NOTE: General reference. The Studio , G.S. Whittet, 'May days for the Moderns: London commentary', pg. 10-11, London, Jul 1963. I blame Duchamp: my life's adventures in art , 'Sidney Nolan', pg. 58-65, Sydney, 2009, 64.